I can no longer take it. As a human I am offended. Stop using the following ugly fonts. I thought my friend and I were alone in our font snobbery! Thank you for this!! Well holding a BA in Graphic Design and having taken several typography classes, I'm not just a font snob, but a font snob educated in the area of font snoberey :). I think you picked the biggest offenders, Comis Sans being the WORST to me. That's so funny! I sell Uppercase Living vinyl lettering and Papyrus and Curlz are some of my most popular sellers. They are not my favs though. Comic sans is the worse. Amen! You can get tons of them for free too! From, a fellow font snob. I don't get it. How is papyrus ugly? Maybe overused, but ugly? curlz is my number 1 pet peeve font...P L E A S E...there are way too many awesome fonts for it to get the usage it does...ugh! I think the only thing that might be worse than Comic Sans is when people tYpE lIkE tHiS, makes me want to ScReAm!!! I can live with "bad font". Carppy grammar bothers me WAY worse!!! Did you see our tweets about this? These fonts equal total fail. Especially when blog designers use them. Ick! I think the deal with these four fonts is over usage. Also, readability is not great except with Comic Sans and that one looks unprofessional. i was worried you were going to hate one i loved....but you dont...as far as i know. Those fonts don't bother me all that much. I agree they are overused and a bit tiresome but the size and color of the fonts are what bother me. I have macular degeneration in one eye and even with corrective lenses, I have to zoom larger when I come to a blog like yours that has tiny lettering. I don't even try to read what you print in the tiny blue letters. Lol, I am *such* a font snob too. I absolutely detest the curlz font. The others don't make my eyes bleed as badly as it does yours, apparently. But I can definitely think of a few others that do. I don't even notice fonts. ?? Am I weird? I tend to just use a basic Times New Roman when I'm doing ads and things because I figure it's classic and simple. Please tell me it isn't terribly ugly! Sorry to disagree but I love Papyrus. I, too, am a font-snob. I actually thought about doing a post like this -- but - thanks Julie for posting this!! Maybe this will help save someone from the crime of ugly-fontness? my husband always teases me about how I can take 3 minutes to type something up and then take 15 minutes deciding which font to use. The font sets the mood, and it has to be JUST right! I totally agree with you about the overused ones! I don't like curlz either. Oh how I HATE curlz font!!!!!! I absolutely cannot stand it! Thanks for posting...it really did make my day!!! I'm blushing because I am a font NERD. I didn't know you could download new fonts. I tried once to unzip some file to get the pharmacy font you used on your 'word art' with NO luck. I will have to look into this more now that I know I am offending many many of you!! 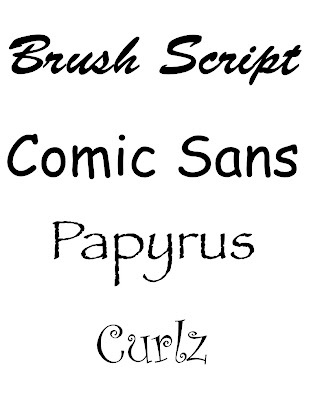 I actually like papyrus. I use it for adding quotes and poems to photobooks. It's clear and easy to read without being boring. I think the problem is over use or not using it correctly more than anything. I have my daughter's name in wood letters in her room using Curlz. Would I use it anywhere else? probably not. Okay when I read your post I was so hoping my "fail safes" would not be on your list since I really value your opinion on this! But they were! I am challenged in the area of technology and you can't post something like this without showing us how to fix it! Please all font knower show me (us) how to download and use way cuter fonts than my tried and trues! I would be forever grateful! Mmkay - thanks! I'm totally with Thirty-Six Ten. I don't care what font you use as long as you USE SPELL CHECK! I can't stand it when fonts are so tiny that I can't read it...or so light in color on the background that I feel like my eyes are about to fall out from straining to read, haha! hysterical! i hate curlz, too!! it was a little bit cute in the beginning, but it's soooooo not even a little bit cute now! OMG. I hate hate hare CURLZ. Not only is it an offensive font, it's spelled wrong. YIKES. Stick with the sans serif, people. silly girl! love it! used to simply love culz when it frist came out and now whenever someone asks me to use it on a bag or towel i simply cringe!!!! Ha Ha Ha...so funny! 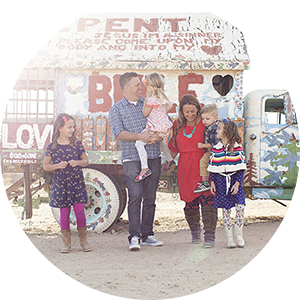 Question, where is your favorite place to download cute fonts. Ever time I go searching, I end up a little disappointed. We got a birthday party invitation, done in comic sans and I immediately thought of you and Mel. Hahaha! Thank you for this public service announcement. I couldn't agree more. oh stinkin funny. well, let's hope your proclamation sticks. + it is free :) I love tips like that, so I thought I'd share where I got it. LOVE your blog. . .LOVE your humor!! All I have to say is AMEN SISTER!!! Please don't judge those who did not inherit the "FSG" (font snob gene). I sure hope there is no offense on my blog, but I imagine there is. If you have a problem with it, please talk to God about it. He made me font-apathetic. But I know you and Mel could have a FSG convention because she helped me with the redesign of my blog. And I think she may have done some FS (font settling). I think I'm going to start sending you e-mails in those fonts, just for fun. papyrus actually doesn't bother me. and i think comic sans is cute for kindergarten teachers. brush script is never, ever okay. Thank you so much for posting this! I will gladly sign the petition. I went to Graphic Design school and I think it was an unspoken truth that if you used any of these fonts you were automatically expelled. In my (humble) font opinion, the font, Kristen ITC should also be banned from being used. It makes my skin crawl. Maybe you should post a few of your favorites!!!! I like Papyrus for a limited use but all the others are ones I despise. My new favorite font is called Upper East Side. It's a Art Deco inspired font and I love it. But I'm all about using fun fonts for titles and then using Times New Roman or Helvetica for the actual text. No, don't snub 'curlz'! Turn that snubbery into teachery: for I have no idea what to do with the pretty fonts once they're downloaded to my desktop. I suppose I could Google a tute...but for now I shall continue using 'curlz' in an exceedingly excessive manner. "Chiller" totally freaks me out. Ugh, I couldn't agree more! I couldn't agree with you more. Whoever though comic sans and curlz were good enough for all the junk they're on is wrong! Too funny Julie! I once had a client who SPECIFICALLY requested that I use Curlz. Yikes. Thanks for your fabulous holiday ideas. Keep 'em coming! lol I had no clue people cared about fonts!!!? When I was a teacher, I ALWAYS used comic sans on worksheets b/c my 3rd graders preferred it...the "a"s are the way they write, not this "a".